December - "How I got into Amateur Radio"
"How to get the best out of your Digital Set Top TV box"
This was a varied evening offering a wide appeal of subjects. Harry, G5HF introduced Brian, G4CTS and his Wife, Julie. Brian told us how he got into Amateur Radio and some of his exploits. An absorbing talk with a lot of common sense. Carl, G3PEM gave a detailed run down of popular logging software and gave his recommendation as to what he likes. After the Raffle and break, Murray, G6JYB reviewed what set-top- boxes are available, and how to receive Freeview. A very current talk which kept the large audience in their seats well into overtime. Freeview is the name for the new free-to-view digital terrestrial television service that you can receive through your TV aerial. Approx 30 channels, including digital radio and text channels are available if you buy an adaptor to decode the new signals. Murray explained why a good British manufactured aerial is so important! Murray has kindly left CARS with a set of his 11 slides. Updated March 2003. Click on what you would like to see. Having looked at the slides, click on your browser's BACK button (top left) to come back to this Web Site. CARS relies quite heavily on its successful Raffle run at each meeting. Nomally the pictures of those running it are forgotten; however thanks to Trevor, M5AKA & his digital camers - here are the December Raffle Organisers. 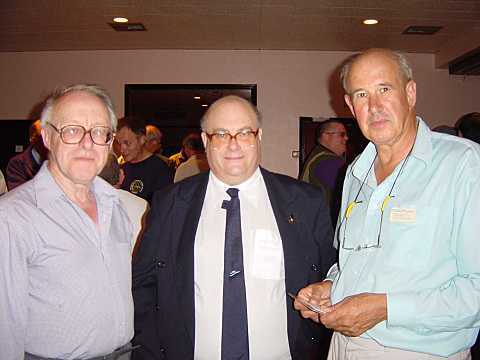 Left to right:- Martyn, G1EFL - Chris, G0IPU & Jim, 2E1GUA. The evening proved dry and this encouraged local youths to let off bangers!. However this did not deter the large audience to enjoy the proceedings. John, G8DET introduced Garry, M0UTH, Chairman of the Colchester Radio Society and his Daughter, M3GEM. Garry invited CARS Members to a Christmas Evening at Colchester on the 19th December. This was appreciated as extending inter-club friendship. 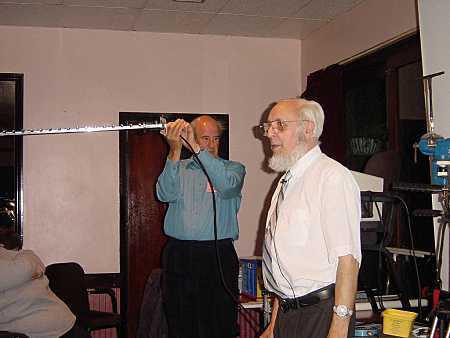 Paul was introduced to the meeting as from Kent Amateur TV Society. He said his interest in Amateur TV Aerials was based on practical experimentation. 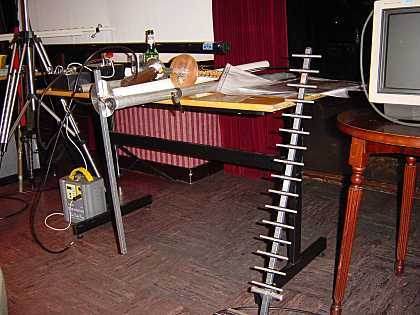 He found that nearly everything could be used to make a successful aerial - to demonstrate this he first produced a CD disk which he placed behind the reference dipole which was used to receive the colour bars transmitted from his car in the carpark on 26cms. It produced about 3db of gain. He then produced some aluminium foil and wound this around wooden dowels. By placing this across the dipole it showed it had even more gain. 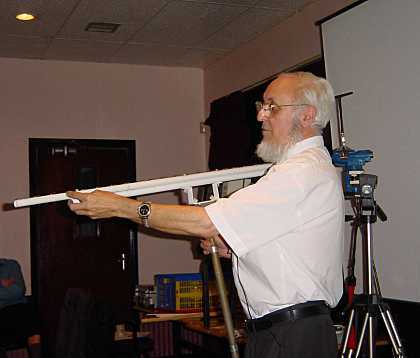 This then led Paul to demonstrate a 10db aluminium, professionally constucted Yagi. A sample of aerials brought by Paul. Photos by Anthony, M1FDE. G8DET holding the 26cm yagi aerial. Due to the metal supports in the room, the signal had changed polorization slightly. The receiving aerial can be seen held in the vice to to right of the picture. Paul, G8IXC holding the beautiful home made 13cm yagi aerial. It was constructed using copper wire supported by white dowel. Paul holding a slot aerial which is really a series of dipole set one above the other. 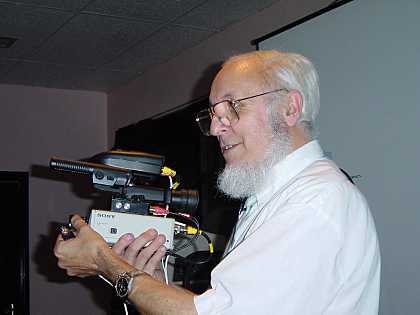 Paul holding a home constructed amateur TV Camera based on a Video Sender. October - Annual General Meeting. The CARS AGM is one of the formal events in the years calendar. The Meeting started with Carl, G3PEM telling the audience that they voted for Chris, G0IPU to receive the Amateur of the Year Award. This was mainly for the tremendous work that he has put in running the many Foundation Courses in Danbury. They have resulted in 26 persons becoming Radio Amateurs. 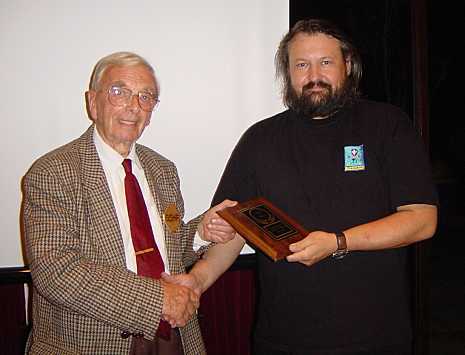 G5HF (left) presenting the Amateur of the Year Award to Chris, G0IPU. 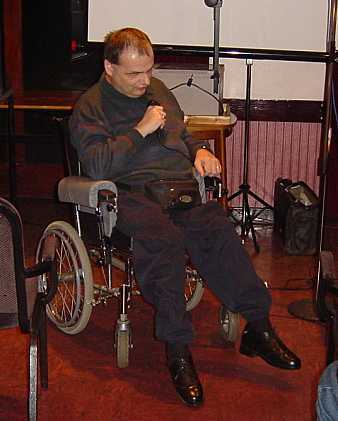 Carl then said that the elders had met and decided that Colin, G0TRM should receive the G3PMX Award for Excellence. This Award was presented to CARS by Ela, G6HKM in memory of the Late President, her Husband, Roy, G3PMX. 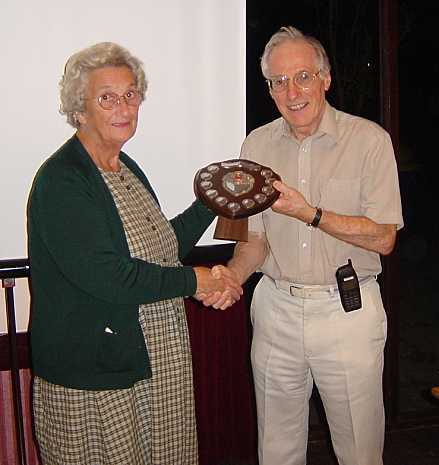 Ela presenting the G3PMX Trophy to Colin, G0TRM. John, G8DET Chaired the meeting and gave his report. He welcomed Visitors, M3s and all Members. He said that it had been a good year for CARS thanks to the support & hard work put in by all the Committee Members. He then mentioned each Committee member by name which was particulary useful to the M3s present who have not had time to know everyone in the Club. The Secretary then gave his report in which he said that the Club had a number external Speakers as well as talented Club Members. There had been 12 Committee Meetings, mainly held in Danbury with average attendance of 12. He then said that the Club Membership was 126, the highest it had ever been. This was due to the M3s, some of which were from out of the normal CARS area and so were not expected to renew their Membership. The Accounts were passed and the Subscription Set. The President, G5HF then took over the meeting until it was proposed that since the existing Committee Members were prepared to serve another year - they were elected en bloc. After a refreshment break, Chris, G0IPU introduced the basis for the structure of the Foundation Course. Murray, G6JYB then showed a selection of high quality PowerPoint slides chosen to test the knowledge of the audience. He highlighted the changes in logging and other procedures in Amateur Radio operations. 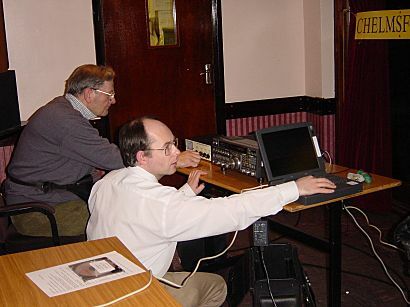 September - Amateur Radio Observation Service by Barry Scarisbrick, G4ACK. Barry travelled from Bristol to present his talk on behalf of the RSGB and started his talk by inviting the Chairman, Vice Chairman and Treasurer to say what they thought the Amateur Radio Observation Service (AROS) was. He then built on the replies he received to correct and expand the role of the AROS. He explained that the RSGB were acting as agents for the Radio Authority and that AROS reported to the RSGB. When he took on the job 2 years ago he had 5 Observers which has now expanded to 16. These are distributed evenly throughout the UK and cover all bands and times of operation. After a lively question & answer session Barry was thanked by John, Chairman who asked him to draw the many Raffle Prizes. Barry then presented Ron Ingate, M3CAM with his Chelmsford Award and asked him to display it in his shack with pride. 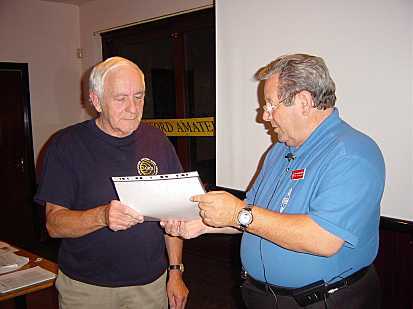 Ron Ingate, M3CAM (left) receiving the Chelmsford Award from Barry Scarisbrich, G4ACK. August Table Top Sale by Colin, G0TRM. Although this year’s sale was held during the height of summer, (what summer) attendance and raffle takings broke all records. Many thanks to Ken G4RFT and to Ralph G3NAA who ran the raffle. 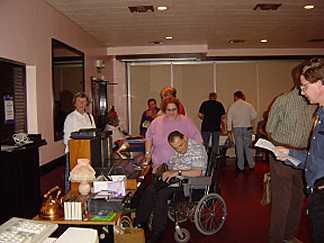 Takings from the table fees and Members donations also reached a good figure, a reflection of very worthwhile sales at some of the tables. All photographs by Trevor, M5AKA. As always we were very pleased to see Mike Wheaton, G4ZPE (or as everyone knows him as‘Zippy’) from Waters and Stanton who came with the usual abundance of worthwhile goodies which were eagerly snapped up. Also many thanks to W&S, for the Shack Clock that made an outstanding contribution to the raffle prizes. Social event as well as bargain hunting. Many favourable comments were received about the evening, as Members had plenty of time to meet and put faces to call signs, at the same time as having the opportunity to pick up a few bargains from a variety of sources. Dave Penny, G3PEN engraving a lapel badge. Seated is Ela, G6HKM and Jill Bradley, excellent cake maker. Peter Chadwick one time CARS Committee Member and Past President of the RSGB paid a surprise visit to the sale and met many old friends and made some new ones. He could not resist the temptation to buy a few goodies himself. A good time was had by all. 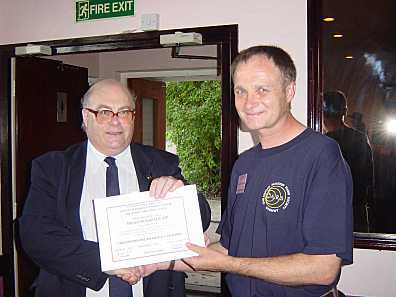 Martyn, G1EFL/M3VAM receiving his Chelmsford Award Certificate from Peter Chadwick, G3RZP. Martyn produced this Award and is receiving the first one issued. 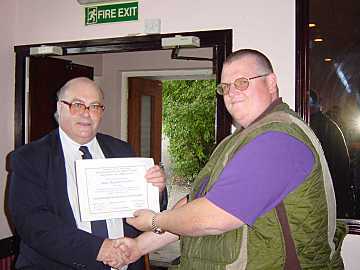 Jim, 2E1GUA receiving his Chelmsford Award from Peter Chadwick. Jim is also M3GUA - well done. The Award is given with a donation to the Essex Air Ambulance. July, 2002. From Rig to Radiator. Brian described how to align your Rig, Feeder and Aerial using an ATU for maximum power and minimum interference to other Amateurs and nearby domestic apparatus. Brian sets up the Club Rigs for International Marconi Day and he has found that sometimes the rig settings at the end of the day are not as he would have liked to have seen!. Newcomers and experienced operator alike were able to learn something (which they may have forgotten)". After tea Brian led the discussion on this subject. A subject which came up was PME Mains. This is were the local electricity board has discontinued the earth on the feeder cable to one's home and banged an earth rod in to regain the Earth connection. An interesting evening, thank you Brian. June, 2002. It's the Constructor's Competition!. Anthony, M1FDE held up a heating element and a plastic box. He explained that the traditional wall mounted thermostat in his house had failed so he had built an electronic one. This had lights to show when it was calling for heat and was very successful until his Father-in-Law knocked the wall down on which it was mounted!. Fred, G3FWD?? presented a Video Camera PSU constructed mainly by Fred, G2HNF. It was a lovely box which contained a large battery for long running operations. Very nicely made with the case made out of 2 modem cases. The feet retaining screws holding the caes together - a very neat technique. Bob, M0CSV showed a Nixie Tubed digital clock which was mains driven. Nixie tubes were quite cheap 20 years ago but now are up to £12.00 each and Bob had 7!. They do provide a very easy to read and bright display. Bob's unit derived it's time from the mains 50hz and he had noticed that this did vary a little during the day as the demand on the GEGB (as was) generating stations varied. It was good for a Station Clock. Awarded 2nd Prize. Carl, G3PEM showed a HF Noise bridge which cost a few pounds sterling to made and provided similar results to the Club's MFJ but without a digital read-out. A pen and paper was required to make the calculation. Nicely presented in a metal box with easy to use connectors. Awarded 3rd Prize. Bob, M1DTA showed a Microphone Amplifier designed by Bob Boddy of Waters and Stanton. This Amplifier was the basis for the Dengie ARS Club's Contructors Competition and cost less than £1.00 - this mainly being the price of the wind muff!. Zippy had tested it as a working unit. Awarded the Prize for a First Time Entry. Very good unit which Net users try and encourage Bob not to use as he then tends to have long QSOs!. Dennis, G8AAE presented a PIC Controller. These are all the rage at present and are often featured in RadCom. Tony, G4YTG held up a 2 Metre Aerial. He said that that earlier that day he thought he should make something this was it. It took minutes to assemble and 4 hours to make work!. It was based on the car flags which were all the rage for Jubilee Week. Tony then donated it to the CARS Raffle. Thanks Tony. Colin presented Geoff, G7KLV's LC Bridge. Geoff had prepared a diagram of the bridge so that the audience could follow its workings but Colin had strict instructions not to open the box as the soldering was not that good!. Awarded First Prize. 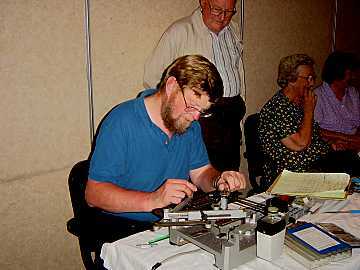 Colin, G0TRM then presented his home constructed Morse Key. This was made from a One Hole Punch as used in the stationery field - hence its name of "A Stationery Keyer". It was attached to a historical ruler which quoted the dated of the English Kings & Queens - very useful when bored. At the AGM the President, Harry G5HF suggested that there should be a Special Award for the "best" generator of electricity without using the mains. For this Meeting there is no restrictions on how it can be done but next year it will be along the lines of powering a 1milli-watt transmitter or a receiver. Obviously one could enter a PP3 Battery but it is possible someone else may think of that!. Colin, G0TRM entered a Solar Panel driven radio in the "Alternative Power Source Competion". It was demonstrated using a 40 Watt electric light bulb. Awarded the Prize in this category. After Tea Harry described and demonstrated 10 alternative ways to produce power with their advantages and disadvantages. The most effecient being the petrol engined generator. Harry showed a LCD Clock driven by 2 wet cells which were 10 years old and only have to have top-up water added after a hot summer. Thank you Harry for such an interesting conclusion to the evening. Donald was for many years a full time Radio Officer. Amateur Television has gone through a number of different stages in the past 30 years from great racks of equipment to today when the availability of computers and computer based equipment can be utilized. Ian gave an absorbing, illustrated talk assisted by Howard. The large audience were treated to a combination of history, technical detail, how to achieve results and a bit of crystal gazing. Much of the evening they used a Video Camera displaying the results on a monitor and on a 23cms link where another TV displayed the results. Thank you Ian for an absorbing presentation. Prof Simons lecture covered from Hertz through the development of conduction and induction wireless systems and Marconi's work up to the Trans-Atlantic communication in 1901. He mentioned that nearly every date at which Marconi conducted experiments was dogged by bad weather. He also said that it was the Press who incorrectly said that "Marconi invented Wireless". Prof Simons played a recording of Marconi actually speaking about the Trans-Atlantic experiment in 1901. Also played was a recording of the activities at Writtle, 2MT (Emma Toc) operation and Marconi opening a Radio Fair from the ship Elettra and relayed from Portishead in 1931. Marconi's experiments from 1000's of Metres to 25cm wavelength was mentioned. Prof. Simons is Former Technical Director of Marconi Radar Systems and is Visiting Principal of Engineering at Sussex University. He also lectures at Queen Mary College. A very good Lecture which was first given to the IEE in 1984. The February Meeting - PSK31. 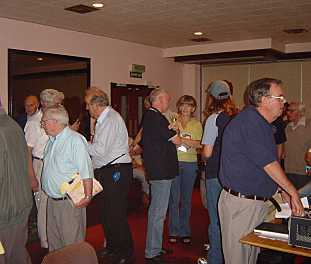 The large meeting room was filling up from 7.15pm - many new Members who had joined through the Foundation Course. They were welcomed by Chairman, John, G8DET. To start the evening off John showed a video of the Saturaday, 8th and Wednesday, 12th of December when CARS were celebrating the 100 year Marconi event of sending telegraph signals across the Atlantic. Many Club Members were seen, some dressed in Victorian clothes. Then the video switched and showed a monologue given by Harry, G5HF about a flood "up north and an Ark" at the CARS Christmas Dinner. While the video was being shown, Iain set up a lovely LCD projector connected to a laptop computer. John introduced Iain who then cativated the audience with a slide show about PSK31. 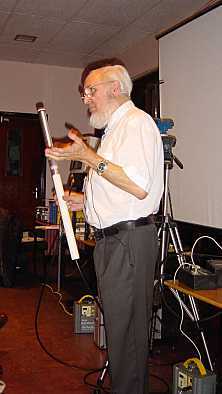 He described the method whereby a computer - interface and software replicates a RTTY QSO without a crashing teletypewriter. 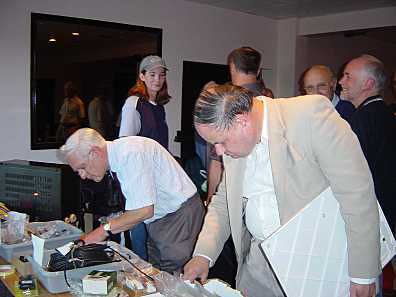 Brian, G3CVI and Iain, G0OZS (right) adjusting the Aerial Tuning Unit for the 767 Transceiver. Photograph by Anthony, M1FDE. Iain showed on the screen the program Digipan and showed off-air a QSO on the panoramic display and the printed word on the screen - very impressive. Trevor, M5AKA had produced a CD Data disk which contained a number of different PSK31 programs as well as SSTV. It also had the past 2 years of CARS Newsletters in PDF form together with many excellent pictures of recent club activities. Thank you Iain for such a well presented and interesting evening. A number of Members have now loaded PSK31 Programs and at least Brian, G3CVI has had a contact with a German station which lasted 12 minutes. The January Meeting - Club Junk Sale. Colin sold much of the goods on display and kept up a good sales patter assisted by Runners Chris and Martyn with David and Jill as Treasurers. Colin, G0TRM holding a Sony VHF Tuner at the January Junk Sale. 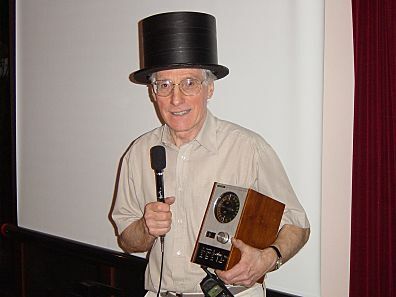 Colin is wearing Harry, G5HF's Hat made for the visit of Princess Elettra to Chelmsford on the 8th December 2001. Photograph was taken by Trevor, M5AKA using a Spy Sized digital Camera. The Raffle produced some worthy prizes. Another well attended enjoyable evening.